The Mummy Pharaoh is an awesome RPG adventure game from indie_games_studio. Alan goes in search of treasure, to the world of the desert and the pyramids, namely to Egypt. Entering the pyramid, Alan woke her tenants, mummies. Now you have a chance not only to find the mysterious treasures of the pharaoh, and to get rich, but also to free the suffering souls of people who have been locked in the guise of mummies for many centuries. You can free the souls trapped in their bodies by killing mummies. You need to be very careful not to awaken someone else is more terrible than mummies. The inhabitants of ancient Egypt were geniuses in the creation of traps, for those who want to disturb the crypt of Pharaoh, and rob him. If you get stuck in the game, check out the video walkthrough and gameplay for the game. 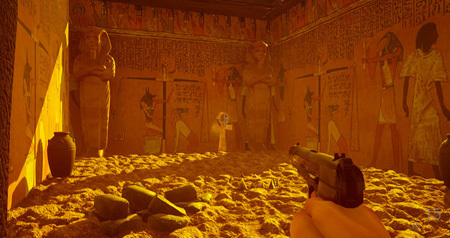 This entry was posted in PC Games, Walkthrough and tagged The Mummy Pharaoh Cheats, The Mummy Pharaoh Game, The Mummy Pharaoh Gameplay, The Mummy Pharaoh Guide, The Mummy Pharaoh Hints, The Mummy Pharaoh Review, The Mummy Pharaoh Solutions, The Mummy Pharaoh Strategy, The Mummy Pharaoh Tips, The Mummy Pharaoh Walkthrough by Marvin. Bookmark the permalink.